We can handle it when they, the AARP, the American Association of Retired Persons, 'say' they are not competing with for-profit insurance companies when, in fact, the AARP is one of the world's largest retailers of health care insurance, travel insurance and life insurance in the history of man. The American political landscape is littered with the carcasses and skeletons of brave souls who have done so in the past...and not lived politically to be able to regret it. 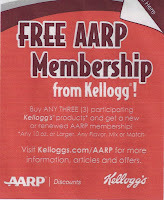 But what we can not stomach is opening up a new box of Raisin Bran early in the morning, somewhat bleary-eyed, and read the following: 'Buy any 3 Kellogg's products and get a new or renewed AARP membership'! A membership that only costs $10 to begin with! Why not put this AARP promotion on a pack of prunes instead? Or how about some Depends adult diapers? Are we that old and senile now, fellow Boomers? Can we really be 'bought' by a free membership to join one of the main reasons why we are leaving our children and their children with this enormous debt to pay off, the notorious AARP? Is there no shame anymore? We are being bought out for 15% discounts on movie tickets and early-bird specials at Denny's and IHOP! We can not think of another single organization in Washington that is more directly responsible for the exploding budget deficits than the AARP. We have looked and searched and hunted high-and-low for ANY indication or scrap from the historical archives that the AARP has actually proposed or supported any responsible budget solution that would take the inherent budget cost drivers out of the costs of Social Security, and more acutely, Medicare over the past 25 years....and we have come up flat empty. Without blinking or suppressing laughter, the AARP maintains that every senior citizen, including Warren Buffett and other super-billionaires, deserve their full complement of entitlement spending once they pass the age of 65 for Medicare and 66 for Social Security. Why, it almost amounts to $3000/month for Mr. Buffett today! What would he do without Social Security to depend on? If you die 1 second before midnight the day before you turn 66 to become eligible to receive your first SS check of about $2000/month, you get nothing. Squadoosh. Zippo. After all those years of hard work and having money withheld from your weekly paychecks to something called 'FICA' that many people still do not know what it means. That is crazy. And unfair. And far inferior to the private account system Chileans passed into law 30 years ago. Just about the time the Caliphates at the AARP decided to stand in the doorway to any common-sensical improvements to a system that is almost as old as the current Chicago Cubs World Series drought. Nope. This is the last straw. We are not going to take it anymore. No more Kellogg's products bought any more, certainly not Raisin Bran. We think there should be a national uprising of every person under the age of 55 to do the same: boycott Kellogg's products for supporting such an organization as the AARP that routinely skirts the law to run their 'non-profit' (sic) financial empire with tax-advantaged status across-the-board and which engages in overt political activity in violation of their non-profit status. 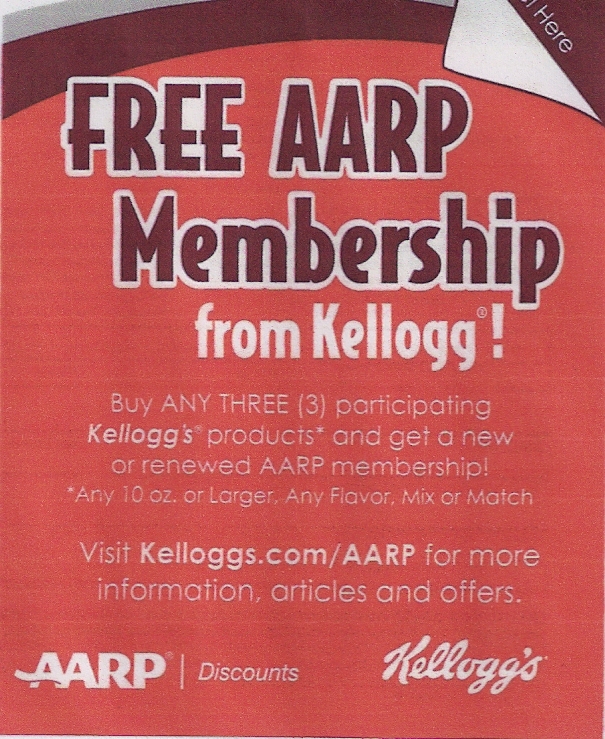 And for those of you over the age of 55 who, for some reason, have already succumbed to the temptation of buying 3 Kellogg's cereals so you can get a free $10 membership to this monolithic organization in order to get 15% discounts on movie tickets, please tear up your card and ask the AARP for a refund. They probably won't give it to you. But the only way to stop the AARP from destroying your children's future with their intransigence to common-sense budget solutions is to have their membership slowly start to dwindle from 44 million to 40 million; to 30 million and then down to 1 million members and then vanish into the sunset of history. So stop buying Kellogg's cereals. Tell all your friends to do the same. Eat some prunes instead. You'll feel better about yourself when you do all three. celebrates the actual empowerment of workers. senior fellow at the Cato Institute in Washington, D.C.
one of several conservatively managed and regulated pension funds. programmed withdrawals (inheriting any funds left over).Over the last three decades these accounts have averaged annual returns of 9.23% above inflation. By contrast, U.S. Social Security pays a 1% to 2% (theoretical) return, and even less for new workers. three market crashes, it's nearly 13,000.
would have paid him $18,000. First, implicit debts must be made explicit, which most politicians abhor. with new streams of tax revenue. paying out more in benefits than it gets in payroll tax revenue. Treasury has to issue even more debt. 2037. If nothing is done, payouts will have to be slashed 22%. Thirty countries have adopted a Chilean-style system. Yet U.S. reform efforts have been timid. Rep. Paul Ryan's "Road Map"
I'm not against privatizing social security. In fact, I would prefer to divert my future funds towards an individual account rather than give it to the fed to spend how they want...Honest question. With current social security tax revenue falling short of obligations, the trust fund is being used...since the trust fund is an I.O.U. where does the money come from??? I'm guessing tax revenue and the sale of treasuries...if millions of Americans suddenly divert some or all of their SS to a privatized fund won't that fuel an immediate need to raise taxes and/or deplete the trust fund early...if trust fund is depleted early and future workers are paying into a private fund, how will the seniors get any money at all? Seems that this mess doesn't offer a straight-forward fix. no straight-forward answer...which is why we should have gone to a Chilean-style SS system 30 years ago when they did...and we dilly-dallied and didn't. they used something called 'redemption bonds' to try to account for past contributions to the defunct system. may have worked but once people saw they could get 9.5% annual returns instead of next to zero, they were probably so thrilled to get that that they didn't care if their past contributions were fully recovered or not. the fictional SS Surplus Trust Fund is being depleted today as we speak...whenever annual SS outflows exceeds payroll tax inflows, the accounting on the Excel spreadsheet shows a net decrease in the Trust Fund account. but is all paper accounting anyway, no real money changes hands. so to answer your question, if there is a shortfall, it is 'paid for' by current revenues in the form of tax receipts and 40% by what? 'MORE BORROWING'!! Last year there was approximately 25 billion shortfall. I think the big concern would be the seniors who are on SS at the time the trust fund expires....Unfortunately the likely outcome of all this will be an increase in the SS tax and a raising of the retirement age. Another joke was the reduction in employee paid SS this year by Congress, it went from 6.2 to 4.2 percent all while revenues fell short of obligations. Thanks for the additional info.